The Manor Vail was the best decision I made for my wedding! I had a very small event with only 25 guests but I was never treated like a small event - I feel I would have gotten the same excellent service with a 250 guest event. The Aspen Room was a beautiful, perfect fit for my small wedding reception and the food was AMAZING! The guest rooms were large and comfortable and my guests raved about the free hot breakfast. The sales staff answered my questions quickly and the events staff was awesome to work with to make my dream wedding come true. I would highly recommend Manor Vail to anyone looking for an event, large or small! We had an outstanding experience working with the team at Manor Vail for our rehearsal dinner, a reception party, and lodging for our guests. Food was exceptional! Fresh, hot, and delivered on time. Our guests also enjoyed the the complimentary full breakfast. Lots of options. a full breakfast buffet including omelet station. Rooms exceeded expectations! They were gorgeous. I had been expecting "Nice" but "Gorgeous" was even better. We also felt the price was very reasonable. A two night minimum was required but we did not have difficulty meeting that. Communication and information from the team at Manor Vail was excellent. I always knew what was happening, when payments were due, what was included and what was going to happen next. They were very responsive to e-mails and calls and usually got back to me within a few hours. The team also worked with us to meet our budget on the dinner and party. They worked out an option that is not on the standard catering menu to keep us within our budget. This property has been newly renovated and you should RUN, RUN, RUN to book your wedding here. Employees went above and beyond, property is gorgeous, food is amazing, rooms are awesome. We had our son and new daughter in law's wedding on 10/1/16 and preceding gatherings here the week before. Our guests raved, the bride and groom were thrilled, all were happy. I couldn't have asked for more. It was wonderful to have everyone staying on property and able to connect with out of state relatives and friends so easily. This is a no-brainier. I couldn't have been happier with our decision and it truly went off without a hitch. Absolutely lovely! This property connects over a covered bridge to Betty Ford Gardens, also. Truly beautiful site to hold a wedding. From the staff, to the beautiful rooms, the food, the service - everything exceeded our expectations. The team at Manor Vail, Jessica, Courtney and Bree really take the time to get to know you and make the process seamless. We had so many options, we ended up having our ceremony in the gardens and then reception in the Fitz Restaurant. Everything turned out beautifully and the views are breathtaking. This is little diamond in Vail was the perfect location to house all our guests and on a reasonable budget. I would recommend viewing the grounds, you will fall in love and you will be booking your wedding here. Thank you Manor Vail for hosting our perfect day! Cannot wait to share pictures. It was such a pleasure to work with you both! We are so pleased you enjoyed the beautiful Golden Peak Gardens, the hip Fitz Bar & Restaurant, the delicious food, and our stellar service our team provided you and your guests at Manor Vail Lodge. We hope to have you back to visit us soon. Congratulations on your marriage! 5 STARS!! We had a gorgeous winter wedding in the heart of the property, the snow-covered lawn in the center of the manor. Our ceremony photos with the manor and the mountain in the background were so remarkable. Our reception was in the Fitz bar and restaurant. The ambiance was perfect and the food absolutely delicious. Their pastry chef also made the most amazing wedding cake! The staff was so great to work with, and they seemed so excited to make our big day the best day ever. We saw many guest rooms as a majority of our wedding guests stayed at the Manor Vail Lodge. It was so fun to see how each room was decorated and laid out differently. As these rooms are all rated with a "gold" or "platinum" status, I never saw a run-down room. The staff explained that once a room is downgraded to a "silver" status, it is renovated, which was quite encouraging to us as we wanted each wedding guest to have a nice room. Make Manor Vail Lodge your residence for your vacation or book it for your wedding--you won't be sorry!!! BOOK, BOOK BOOK! If you want your wedding experience to go off without a hitch, then seriously consider the Manor Vail Lodge. Every single employee treated us like family and took care of foreshadowing issues well ahead of time. They checked in on us daily and always went well above and beyond any other hotel staff I've ever stayed with. We even rented out the patio area of The Fitz for our rehearsal dinner and it was exceptional service; very personal, professional, and perfect. Our only regret is that we did't have our wedding dinner with them as well! Best staff ever! Met our every need- gorgeous setting! The Manor Vail Lodge exceeded our expectations all the way around. I would highly recommend this venue. We had our Sons Wedding "Welcome Reception" at the Fitz Restaurant with about 85 guests. Jessica and Bree were a delight to work with, just awesome! The venue was super fun, the food was amazing and our guests only had positive feedback. Everyone at the Manor Vail was 100% professional. It was a perfect evening and we couldn't be happier! Best outdoor venue in Vail--hands down! 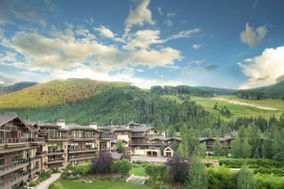 We chose Manor Vail Lodge for the epic outdoor venue, the grand windows and fireplace in The Fitz Restaurant, the property's mountain feel, and the affordable condo rentals. Nearly all our wedding guests stayed at the Manor Vail Lodge, and they all loved the property, breakfast, and condos. Our guests keep talking about the wedding and how much they want to return to Vail. Thanks so much, Manor Vail, for making our wedding so memorable!